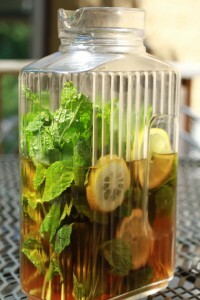 This week we are serving up a variety of mint for some cool down recipes that will help you beat the heat! Simply snip and wash fresh your choice of mint and then pack loosely in a jar. Fill with water and leave in the sun for the day. After 6-8 hours, strain the mint leaves from the tea. Sweeten tea if desired and serve over ice. Cut the cucumbers in half lengthwise. Use a teaspoon to scrape out the seeds, then cut into thin slices. Toss the cucumbers with the salt in a colander. Let drain in the sink for at least 30 minutes, then tap the colander on the base of the sink to release any remaining water. Lay a clean dish towel flat on the counter, and then dump the cucumbers over top. Use the edges of the towel to blot the cucumbers dry. Soak the red onions in a small bowl of ice water for ten minutes, then drain in a fine mesh strainer. In a medium bowl, combine the cucumbers, onions, white wine vinegar, olive oil, vegetable oil, sugar, pepper and mint. Taste and adjust seasoning if necessary. Cover and let stand in refrigerator for at least 20 minutes. Serve cold.